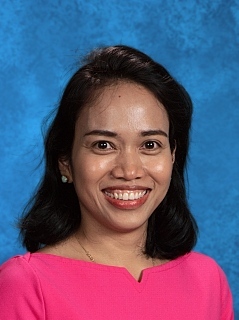 Hi, I’m Angelica Reyes, and I am the computer teacher here at Nativity. I was born and raised in Manila, Philippines. I attended Catholic schools from preschool until college. I obtained a Bachelor of Science in Management of Financial Institutions degree, as well as a certificate in education from De La Salle University. I taught algebra, statistics, basic accounting, and partnership and corporation at the high school level for four years prior to moving to Colorado in 2008. My first teaching job in the state was at St. Therese School in Aurora, where I taught for three years. I’m now in my fifth year at Nativity and my eighth year teaching in the Archdiocese of Denver. I love teaching and learning from the students. I am married to my wonderful husband, Paolo, and together we have three children: a son and two daughters. My favorite thing to do is to stay at home and spend time with my family, particularly when it’s cold outside. I am a big fan of warm, sunshiny days. I love that Colorado has so many days of sunshine. It reminds me of the warm weather back home in the Philippines, especially during the fall, winter, and spring seasons there.